Unleashed Poker is a brand new poker site launched in 2010. It offers a massive selection of cash games, tournaments and it accepts US players. The 110% up to $600 welcome bonus is worth signing up for plus you can get a massive 33% rakeback deal through us using the Unleashed Poker Bonus Code pnbUP! 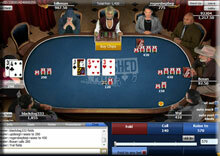 Unleashed Poker was set up in November 2010 and operates on the US-friendly Cake Poker network. Unleashed Poker is licensed by the Government of the Netherland Antilles, and as a new poker site it offers everything that you’d expect and hope for, including soft cash games, a variety of promotions, gorgeous, sleek software and live tournament qualifications. Unleashed Poker offers a huge variety of promotions and rewards schemes. Every player has the chance to win $300,000 in monthly cash made up from an assortment of re-load bonuses, prizes and special freerolls. The $25,000 Gold Card Race, Match & Win Promotions and Gold Card Exchange Market make Unleashed Poker a very exciting and profitable poker site for 2011. For US poker players who want to deposit at Unleashed Poker, things couldn’t be easier, with an array deposit methods including eWalletXpress, VISA, Moneybookers, ukash and UseMyWallet. You can sign up with Unleashed Poker Bonus Code “pnbUP” and receive a mouth watering 110% up to $600 welcome bonus, plus 33% rakeback for life! What’s more, you’ll also receive entry into exclusive an exclusive $500 first-depositors freeroll that is played every Saturday at 2:00 PM EST. All that you have to do to take advantage this great bonus is download the Unleashed software, register your player account and make a first minimum deposit of $30. You’ll find a pretty good swarm of fish in the low stakes games at Unleashed Poker and because they operate on the US-friendly Cake Network finding an active table across the small and mid stakes tables or PLO games shouldn’t be a problem! Unleashed Poker offers a great selection of poker games which includes Texas Hold’Em, Omaha, Omaha Hi-Lo, Seven Card Stud and Seven Card Stud Hi-Lo. No Limit stakes start from $0.02/$0.04 up to $500/$1,000 and the crazy SNGs grinders amongst you can play SNGs from just $1 up to $500 in buy-ins. For tournaments lovers, there’s a huge amount of tournaments running daily for all players and abilities. The biggest events include the weekly $100 GTD and monthly $200 GTD and you can take part in freerolls to major events such as the Aussie Millions 2011. Unleashed Poker’s software is one of the best. You can select from a range of 3D avatars at the table, and finding a profitable game in the lobby is so incredibly easy with table statistics like player-per-flop %, average pot-size and hands per hour. You can split games in the lobby into many subcategories, such as No Limit Ring Games, Sit and Goes, Texas Holdem or Omaha etc. The tournament lobby lets you flick between scheduled, satellites, Gold Card, freeroll, private and sit and go events. The lobby also makes it easy for you to view or make changes to your account details. When you open up the cashier, it’s very easy to make a deposit/withdrawal using the options given to you. You can customise the card deck colour (4 colour deck), your table buy-in and re-buys, enable/disable chat options and resize your table. Deposit options are very good too. US players can choose from a variety of US-accepted methods such as eWalletXpress, VISA, Maestro, Moneybookers, ukash, UseMyWallet, DinersClub, ClickandBuy, WebMoney, EcoCard, and Neteller.